Enchanted Excurse: Let's Not Quit! Disclosure: I received 5 Habits of a Woman Who Doesn't Quit by Nicki Koziarz from B&H Publishing complimentary. Provided I give an honest response. Have you ever gotten to the place where you just couldn’t take it anymore? Dreams. Programs. Jobs. Relationships. There are so many different areas where we feel like calling it quits. It’s time for an honest conversation on how not to give in to the temptation to give up. Nicki Koziarz is a woman who has thrown in the towel a time or two. In fact, she’s quit just about everything in her life. But with God’s help, she’s discovered a few habits that have helped her and others conquer the choice to quit. 5 Habits of a Woman Who Doesn’t Quit will enable you to: Evaluate the internal personal struggles that make you want to quit. Cultivate consistent habits to help you progress toward your goals. Receive a fresh dose of perspective from the Bible that will help you develop perseverance. You are not made to quit! Join Nicki as she identifies five habits to help you keep going no matter what struggles may come your way. My Review: I found this book interesting when the author is talking about how she started on her journey of learning not to quit. I have issues with quitting at times and procrastinating. She explains how her husband pointed out to her how she quits with nearly everything. She also starts asking herself is she quitting with God and every part of her life? 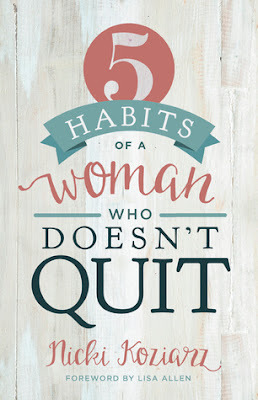 She writes out 5 habits of how not to quit. The 5 habits are: 1. She accepts the assignment of refinement 2. She follows through with her commitments despite how she feels 3. She stays open to the movement of God 4. She gives others what she needs 5. She moves forward in faith. With each of these habits she explains about her life and how she used started to use these habits. I also enjoy how she puts in scripture here in there about the faith of Ruth, because Ruth is such a great role model for us to be like. I will say this book was a tad on the slow side for me to read and I must reread it myself. I may get more out of it the second time I read it. But for now I will give this book an okay rating. But you never know it may help you if you deal with issues of quitting. If this book intrigues you, you can purchase it at this LINK. Have a Blessed Day!